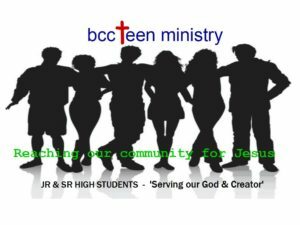 Our goal here at BCC is to provide fun filled – energetic – Jesus centered teaching for our Jr & Sr High Students. We want them to have a blast as they learn to follow Jesus with their lives. We want them to be so excited about this youth ministry that they want to bring all their friends. Our goal is to prepare our teens for a life of adventure as they know Jesus and serve Him all their lives. God is doing something NEW and AMAZING with our Youth Group!! Our Goal as a Student Ministry is that by the time our students go off to Colleges and Universities or straight out to the real world that they are able to successfully hear, accept, and teach the Gospel message to everyone who they come in contact with in their lives. We consciously make an effort to engage with our parents as much as possible to give our students more of the encouragement that they need to live out a life filled with the Gospel. Our job is not to parent, but to come along side of our parents and help give the students what they need to be taken down the path of righteousness. Our desire is to provide the best, safest and friendliest care for your children that we possibly can. Our hope is that your children will experience Jesus and Gods love the way God meant for us to know it. Kids will have fun as they learn the truths from Gods word and see how Jesus can help us live in the world. Tricia is a mom of 4 grown children who love God and serve Him in their lives. 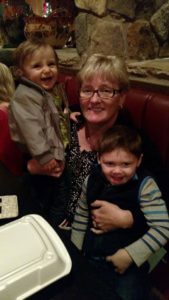 She has 2 grandsons (as you can see from the pic) that love – love – love their YaYa (grand-ma) She is however a very, very young grandma and loves to play and make things crazy-fun for all kids. Tricia has been in Children’s ministry for over 30 years and has so much to offer these little people. We are blessed to have her wisdom and experience here at BCC. Our Children have specialized ministry every Wednesday night at 7pm, while the other groups are meeting in and around the building. Sunday morning Kids Worship – Kids check in at 10:20 in the fellowship hall and have their very own Worship time. BCC offers a FREE Karate Class to all ages all year round. Anyone (6 years old & older) is welcome to sign up for the class and join us. This class meets every Tuesday night at 6pm and goes for 1 hour. The class is taught by our Grand Master (10th degree black belt in Martial Arts)- Sam Barger along with his team of Black Belt Martial Artists. The class is safe for everyone and teaches SELF DISCIPLINE – RESPECT FOR ALL – GOOD HEALTH HABITS AND MUCH MORE. The Class teaches self defense techniques – self control and respect for others. It is not a combative class – there is not fighting or exchanging of punches/kicks in this class. Your student will learn to have self confidence and how to protect themselves. Students can earn their beginner belts in this class and go on to earn more advanced belts if they continue in the program. ADVANCED CLASS – for those who have been moving up the ranks can join a group of karate students on Thursday Night at 6pm in the dojo to further your discipline.